At the bottom of each page is a footer (using smaller point sizes) that also contains links to main sections of the website. The footer area is not provided as the navigation method for the website even though it can be used for that purpose if you so choose. The main method of navigation is to click on menus or links displayed as part of the regular text. To go back, you can always click on the Back arrow in your browser or the title of the page (on our site). The size of text that you see depends on the size of your monitor and the resolution that the monitor is set at. If the resolution is set too high for the size of the monitor, text may appear harder to read. Our web pages are designed using the "default" size of text, the same as over 90% of web pages worldwide. So if the print of our website looks too small to you, there are four possible reasons why. A discussion of the four reasons are listed in the order you should use to check your system out. The first reason shown may be all you need to change. You may not have the default text size set in your browser for the best viewing. Your screen resolution may be set too high for the size monitor you are using. You may not have the same typeface installed that we specify (rarely the case). You may be using an older browser. Reason 1) You may not have the default text size set in your browser for the best viewing. As you get older and your eyes weaken; you may wish to change the default viewing size in your browser. Surprisingly, a lot of people are not aware of this feature, nor take advantage of it. The different browsers think of "changing the size" to mean different things. Some think of it as "changing the text size" but leaving the page layout the same; others think of it as "changing the entire page layout (becoming more common)," effectively zooming in or out (enlarging or decreasing everything). Each method has its pros and cons. For some web page designs, increasing the text size only may cause the text to become too large for the area the text is intended to be displayed. On the other hand, a page that is enlarged entirely may become too large to be viewed on the monitor without scrolling the entire window. It is always good to have both types of browsers handy so that when one is making the enlarged version worse, you can switch to the other browser. At least that was the idea when this page was created, however, the default of going with a Zoom in or out feature has won out for all of the common browsers in use these days. To change the default viewing size in Internet Explorer, choose the View menu, and scroll down to the Text Size choice. Notice the choices range from Largest to Smallest. You should try these out and choose the size that you are most comfortable with. Other browsers such as Avant Browser, and MaxThon Browser have similar methods of changing the typeface size since they are based on Internet Explorer. Tip: Internet Explorer allows you to change text size when the mouse wheel is rolled while the Ctrl key is depressed. 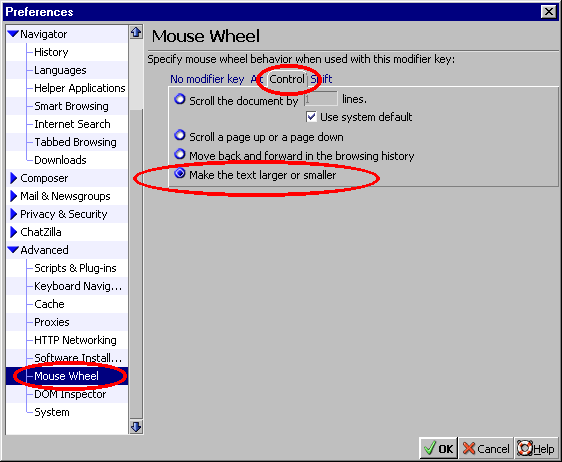 If you have the Microsoft Intellimouse or compatible "wheel" mouse, you can change the settings very easily by pressing the Ctrl key and rolling the wheel on the mouse. For Internet Explorer versions prior to version 7, rolling down increases the text size. Starting with version 7, rolling up increases the size. If the page has lots of text, it may take a moment to update the display (don't roll back and forth unless the page updates instantly, otherwise the computer may hang). Firefox has a similar feature to change the default displayed text size. Firefox changed the menu items starting with version 3.0 Prior to 3.0, the View Menu had a Text Size choice, which then allowed the user to Increase, Decrease, or set the text size to Normal. Starting with version 3.0, the View menu item changed to Zoom, which then allowed the user to Zoom in, Zoom Out, or Reset. The main difference is that versions prior to 3.0, the menu choices affected text but not the layout of the page, which is what you wanted in most cases to read the text easier. Starting with version 3.0, the View | Zoom menu choice refers to the entire page. To be backwards compatible, versions 3.0 and later allow the user to select the Zoom Text Only option. The text size can be increased using the Ctrl key and the plus key (+). Ctrl and minus (-) decreases the text size. Tip: Firefox (modern versions) allows you to change text size when the mouse wheel is rolled while the Ctrl key is depressed. For versions prior to Firefox 3, While pressing Ctrl, roll the mouse wheel down to increase the text size; for version 3 and later, roll the mouse wheel up to increase the size. Most users these days are not using Mozilla (the predecessor to Firefox), or Netscape, which was a browser product* before Internet Explorer came along, then converted to a "Free" but Ad supported product, before being bought, then donated to the Mozilla Foundation. Some of the Netscape internals were used to enhance Mozilla, and later on (2004 era), the group that created Mozilla did a total rewrite to create Firefox, which was necessary to create a better browser to compete with the new kid on the block, the Google Chrome browser. As a result, no one still uses Mozilla or Netscape any more. The details are left here more for a historical perspective. 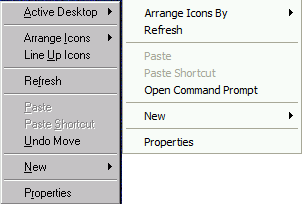 Netscape/Mozilla has a similar feature to change the default displayed text size. In Netscape version 4.7, the choice is View, then Increase Font, or Decrease Font. You can also use the Ctrl key and the right bracket (]) key to increase, and the left bracket([) to decrease. In Netscape versions 6 and 7, the choice changed to View, then Text Zoom. The current setting will be shown (in percent). You can specify the sizes to use in percent or you may "increase" or "decrease" your current settings. Ctrl and the plus(+) and minus(-) keys will allow you to increase and decrease the text size. Tip: Mozilla (modern versions) allows you to change text size when the mouse wheel is rolled while the Ctrl key is depressed. While pressing Ctrl, roll the mouse wheel down to increase the text size. To make sure this will work in Mozilla, you have to make sure the settings are correct, which is not the default settings as the browser is shipped; to do this, you need to edit your preferences. Select Edit | Preferences, then select Advanced, then Mouse Wheel (as shown below). Click on the Ctrl tab, then make sure that the choice "Make the text larger or smaller" is selected. After the adjustment is made, While pressing Ctrl, roll the mouse wheel down to increase the text size. Opera has a similar feature to change the text size displayed. Opera changes the size of the entire page, not just the text size, so the page may get larger than your display width causing you to scroll left and right to read text, or the page may be formatted with sections of text below other sections. The choice is View, then Zoom. Opera uses a few preset sizes such as 120%, 150%, and 200% (and others) that can be chosen in the same menu. Tip: Opera (modern versions) allows you to change text size when the mouse wheel is rolled while the Ctrl key is depressed. Opera increases the size of the page when the mouse is rolled up. The idea being Up increases text size and Down decreases text size. This make sense; too bad Internet Explorer didn't start out this way, which in turn influenced the other browsers to do the same as Internet Explorer. Now, looks like they all are adapting roll up to increase text size. Konqueror has a similar feature to change the text size displayed. From the Konqueror View menu, you can Enlarge Font or Shrink Font. Konqueror changes the size of the text (font), not the entire size of the page. The menu choice is View, then Enlarge Font. Tip: Konqueror allows you to change text size when the mouse wheel is rolled while the Ctrl key is depressed. Konqueror increases the size of the font when the mouse is rolled up. The idea being Up increases text size and Down decreases text size. Other browsers such as Safari Browser, and Google Chrome also have similar methods of changing the typeface size. Reason 2) Your screen resolution matters. The Browser Statistics website shows that the most common screen resolution keeps changing. Also, Rapid tables tracks resolution statistics. This information was compiled in September 2017. The screen resolution you use depends on the size of monitor and the ability of your graphics card. If you have a large monitor, you can get away with a higher resolution. If it makes text too small, you can change to a lower resolution. If it makes portions of the web page wrap, you may need to change to a higher resolution. To effectively use a larger resolution, you may need to upgrade to a larger monitor (larger display area). New larger flat-screen monitors are becoming cheaper and take up less room. The most common size flat-screen monitor is 22 inches or larger. How to adjust your monitor's screen resolution. Notice that the type of Display is shown just below the monitor image. The first single monitor example above shows "NEC MultiSync 3D." It also shows that the display graphics card is the "S3 Vision 868 PCI" model. In some of the older operating systems, if you have not set your graphics display model, the first time you make any changes, you will be asked to select the model. Go to the "Colors" or "Color Quality" control just below the description for the "Display." Using the drop down box, you will see the choices available depending on your graphics card's abilities and the drivers installed for it (recognized by the Operating System). Hopefully your graphics card has choices that allow you to have more than 256 colors. If the maximum number of colors you see is 256, it probably means the drivers are not installed or has not been recognized by the operating system, which may be the case if you are operating in Safe Mode. The colors setting works in conjunction with the screen size/resolution (labeled as Screen area or Screen resolution). If you choose the maximum number of colors, your choices for maximum screen size will most likely be reduced. This is true for the majority of monitor/graphics adapter combinations. Notice this example shows "High Color (16 bit)" and "True Color (32 bit)" choices. Some display cards have other choices (such as a 24 bit choice). The number of bits is an indication of how many colors your graphics card can display. The higher the number, the larger number of colors. This can affect shades and subtle colors that can occur in images made from photographs. Graphics images like the ones above often use very few colors in order to ensure they can be displayed properly on any system. Most web page graphics are made with only 256 colors for this reason. Of course, photos can be the exception, although often photos have the number of colors reduced in order to load faster, but seldom if ever will a photo be reduced to 256 colors. Photographs in animated graphics (animated GIF files) are most likely the only time you will see photographs reduced to 256 colors. Change the setting to "High Color (16 bit)" or "True Color (32 bit)" settings, or even higher if you have it, just to make sure you understand the effect each offers. The higher the selection, the more memory will be needed for graphics, (i.e., True Color (32 bit) settings requires more memory than the High Color (16 bit) setting). Depending on your computer's resources, you may want to choose one over the other. You may wish to experiment and try different settings to see which setting you prefer, and what works best for your computer. The smaller the monitor, the less you will notice the difference. How much memory is used for display purposes can affect your computer's performance. Graphics Adapter Cards have a built in amount of memory, and some high-performance cards have lots of memory, plus an accelerated graphics processor. These types of cards can greatly improve the performance of your overall computer. The most important setting is the screen resolution. The choices available to you depend on your graphics card's abilities and the number of colors setting you chose in the above step. If you have your monitor set to one of the higer resolutions, you can try reducing the resolution to see if it helps in readability. You can change the "Screen area" to a lower resolution by clicking and dragging the slide control to the left or right. Stop when the number changes to the next setting, so you can try one at a time." If you move the slider too far to the right (higher resolutions) than what the number of colors choice you have set at the left allows, then the color choice to the left (the one just set in the prior step) will change (decrease) to allow the higher resolution. Moving the slider back to the left will not change it back. If this does happen, you will need to re-select the number of colors again. Click O.K. The following box will appear: Click "OK" again. Newer versions of MS Windows do a great job of identifying the computer monitor but older versions may need your help. If you have already set your monitor before with Windows 9x/Me, the following box will appear. The image will be smaller if you are increasing your resolution. In this case, it may be difficult to read. If this is the case, then this indicates you are using a very small monitor. If you are using a small portable computer, a small monitor would be normal. Otherwise, click "yes." If you have not adjusted your display settings previously with Windows 9x/Me, you will be prompted to specify the type of monitor you have. This is the same information as shown in step 3 above. A text entry field will appear on your screen if you need to take this step. Newer versions of MS Windows will likely already know about your monitor, but if not, you may see a similar prompt. Using the scroll bars, choose the manufacturer and model number (or a similar model) of your monitor (click on your manufacturer in the left window; select the model number in the right window). Click "OK." The box shown in Step #7 will then appear and you should click "OK." The box from Step #8 will appear; select "YES" if you wish to use the new settings. Somewhere near the bottom of your screen or at least part way down on the left, you'll see a little gray shape that looks like a seatbelt buckle. If you click on it and drag it out, it will expose a "belt" of little pictures (also called "icons") with an even smaller arrow next to each one. Go to the monitor icon that has a black-and-white checkerboard pattern for the screen. This is where you can adjust the resolution. Click on the icon and HOLD YOUR FINGER DOWN ON THE MOUSE. You'll see a "menu" that lists different choices for screen resolution. If you now use a higher resolution than 800x600 (or 832x624), you can decrease the resolution, effectively making the text on the screen larger. Try the 800x600 setting to see if it improves readability by moving the mouse pointer over the setting (if the 800 x 600 choice is not available, bring your mouse pointer to "832 x 624" (to highlight it). This is the Macintosh version of "800 x 600" pixels for some systems). Take your finger off the mouse. You've made the selection! Restart your computer to see the results. Reason 3) You may not have the same typeface installed that we specify (rarely the case). This is most likely to be the case only if you are using a Macintosh or a Unix system. Even if you do not have the same typeface installed, browsers will usually do a substitution with a similar typeface. It is not possible to guarantee that we use a typeface that every system will have installed. To increase the chances that we use a typeface that you have, we use five common typefaces. We specify Arial, Geneva, Helvetica, Tahoma, and Verdana typefaces, not necessarily in that order. Your browser will use the first one that you have installed, or it will choose the default typeface that you have set for your browser if you have not installed any of the typefaces listed. We have no control over the default typeface you have set for your browser. We use Arial, Geneva, Helvetica, Tahoma, and Verdana in an attempt to cover as many systems as possible. Arial, Tahoma, and Verdana are common typefaces in the Windows world. Geneva is also common in the Windows world but even more so in the Macintosh world. Helvetica is common on Unix systems. 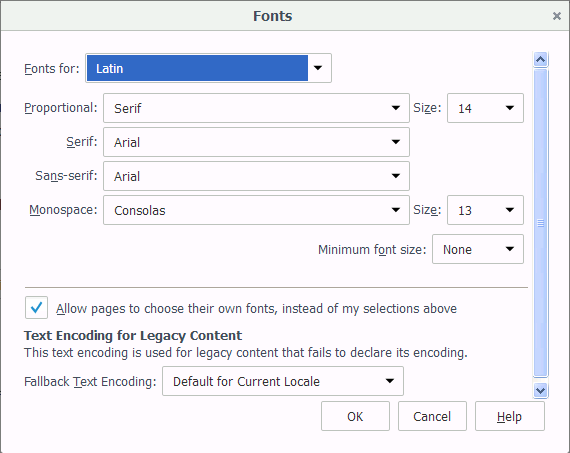 If you do not have one of these typefaces installed, you might want to install them; other websites use them heavily and it could improve your view of the other websites as well. Regardless of the sizes of type used in our website, you may be able to use your own settings and override the values in your browser. Reason 4) You may be using an older browser. Browsers are kept up to date by their manufacturers, occasionally having a new release within a few months of the last release. The later browsers correct bugs and enhance viewing. The most popular browsers are Mozilla Foundation's Firefox, Goggle Chrome, Microsoft's Internet Explorer and Edge, Safari, and Opera. Several browsers claim to implement the most recent web page standards. Currently, Firefox is at the forefront when it comes to standards. There are other browsers, in fact many of them. Most work pretty well, but most do not have the range of support for the standards. There are other browsers built on the Internet Explorer basic components (rendering engine named Trident), and so they work almost the same as Internet Explorer. They generally have features not available in Internet Explorer. If you wish to try out some of these IE based browsers, check out Avant Browser, and MaxThon Browser. Check out some of the other browsers available. Friday, April 19th, 2019, 3:31 P.M. - Last modified: April 18th, 2019 at 22:39:05.